As I reflect back on the terrorist attacks on the World Trade Center, I remember how many of our churches were filled to capacity or beyond. I remember having to bring in extra chairs for the aisles and along the side walls, at least for a few weeks before attendance got back to normal. Now, nine years later, our country faces many challenges. It has long been said that our once great nation would fall from within, and we’re currently seeing much evidence to support this prediction. So, at this critical time, we must be in extra prayer for our nation. So far, no matter how apostate our nation becomes, God has always been faithful to raise up a remnant of godly men and women. We are happy to report that a few have organized a special time of prayer and would encourage our readers to become involved in one or both of these campaigns. Michael Youssef of Leading the Way Ministries launched God Save America, a covenant to pray for our nation from July 1 to November 2. Dr Youssef states that “"We are facing forces that are unabashedly declaring their intention to destroy this nation by disregarding the moral and biblical framework of the founders' convictions. Unless we become involved and are vigilant in prayer, we risk the loss of our freedoms." As of this writing, almost 70,000 people have signed up. In addition, the National Religious Broadcasters began If My People Pray, forty days of prayer for America beginning September 1 thru October 10. This campaign is being supported by Christian ministries such as Coral Ridge, Love Worth Finding and many others. If ever our nation needed prayer, it’s now! Have We Learned Anything in 9 Years? On this anniversary of 911, after posting a retrospect column by Michelle Malkin, we offer a must read from one of my favorite and most respected contemporary columnists, Joseph Farah, the founder, editor and CEO of WorldNetDaily. Today, he has written a very important article which asks the question, Have we learned anything in 9 years? In the process, Mr Farah goes beyond the usual political rhetoric and identifies the actual underlying spiritual issues, so we take the rare step of reproducing his article in its entirety. What have we learned in the nine years since history's most devastating attack on America by Islamic terrorists? We're still involved in two seemingly endless wars half-way around the world that doesn’t seem to have any coherent objectives or definitions of victory. Meanwhile, back home where the attack took place, we're planning to allow a Muslim Brotherhood front group to build a victory mosque. The attack of Sept. 11, 2001, remains a dark cloud in America's history with no silver lining – no awakening to the dangers we face from future subversion by the enemy responsible. It is as if Americans have a collective case of Stockholm Syndrome. Too many of us have become sympathetic to our enemy, the one that killed 3,000 of us and made the rest of us weep. Who would have believed that only seven years after that attack Americans would elect a president raised abroad as a Muslim, bearing a Muslim name and apparently in love with all things Islamic? It would have been inconceivable. Only when he bankrupted and humiliated the country did Americans begin to wise up. The mosque at Ground Zero represents the tip of the iceberg in terms of a long-term threat to the security of this nation. New mosques are springing up all over America – most of them funded by foreign money and controlled by the hideous ideology that form the basis for the attack of 9/11. We're all still screened at airports to prevent yesterday's attack – often by Muslims wearing burkas! Islam is now taught as a religion of peace in our schools, despite 1,300 years of history to the contrary. Our media are full of accounts of an imaginary bigotry called Islamophobia. When Muslims go on the rampage in mass-murder attacks like the one at Fort Hood, members of the media class wring their hands about reporting their names and government officials deny they are examples of terrorism despite the fact that they share the same motivation as the 9/11 hijackers. Muslim Brotherhood front groups parade across our television screens on a regular basis condemning Americans for biases they don't show. Who could have imagined this would be the paralyzing result of that devastating attack? This is insanity. It's a mental illness. There is no other explanation for it. America is deeper in denial today about the threat Islam poses to our security than it was prior to the attack nine years ago. Like it or not, Islam is not a friend to Americans, Christians or Jews – no matter how it is soft-pedaled in certain politically correct circles today. There will be those who try to portray this column as an anti-Muslim screed. It is not. I do not condemn all Muslims. In fact, I have sympathy and compassion for those trapped in their 7th century worldview. I do, however, have a beef with all who subscribe to Saudi-style Shariah law. Muslims in the U.S., who subscribe to Shariah law, have a duty and obligation to place that ideology ahead of any allegiance they might have to the U.S. Constitution. That effectively makes them unworthy of U.S. citizenship. But, then again, we have a president who wipes his feet contemptuously on the Constitution. So I don't expect even a new class of leadership in Congress to require any loyalty test for new citizens. There is, however, something we can do – and must do. For those who recognize the truth in what I am saying, particularly evangelical Christians, let me propose a new strategy in line with what Jesus would command us. Jesus told us to love our enemies. We best express that love by sharing the good news Jesus brought the world. It's time for American Christians to realize what a fertile missions field we have right here in the United States with an expanding Muslim population and many new gathering places they are building. If they have the religious freedom to build these mosques all over America, we have the Christian duty to evangelize them, to persuade them they are worshiping a false god and revering a false prophet – one who, by the way, has no record of making even one prophecy! Since we're all learning more about Islam every day, let's put that knowledge to good use. Let's all vow to make new Muslim friends – and bring them to the saving grace of the one true God of the universe. They'll assure us that they are committed to fighting terror and securing our borders and doing whatever it takes to protect the homeland from another horrific mass murder at the hands of freedom-hating fanatics. And then? Your grandstanding senator will block funding for long-delayed homeland defense measures even as he whines about the need for more money to ensure our safety. To those who lost their lives on September 11 because their government failed to enforce its borders, laws, and sovereignty, the politicians and bureaucrats and civic leaders will ostentatiously offer one day a year of dedication in rhetoric - and 364 days of desecration in deed. Today at sunset begins the Jewish New Year 5771, so we'd like to wish all our Jewish friends a "L'Shanah Tovah!" (have a good year). This holiday is also known as Rosh Hashanah (head of the year) and Yom Teru’ah (Feast of Trumpets - Lev 23:26-32). Actually, all the Jewish fall festivals, aka "Feasts of the Latter Rain", fall in our month of September this year. Next up will be Yom Kippur (Day of Atonement), the most solemn of the Jewish festivals, beginning at sunset on September 17. The official date on our calendar is September 18, but all Jewish holidays begin at sunset on the day before. This holiday commemorates the annual service in which the High Priest would make atonement for himself and the people (Lev 23:26-32), but now Yeshua (Jesus) has sacrificed Himself to provide atonement once for all (Heb 9:11-10:4). Finally, sunset on September 22 begins the seven day celebration of Sukkot (booths), also known as the Feast of Tabernacles (Lev 23:33-43). Sukkot is a joyous time of celebrating the fall harvest. It is also a time of remembrance of how the Jewish ancestors lived in temporary shelters after G-d rescued them from Egypt. Sukkot looks forward to the millennial rest of Israel (Am 9:11-15, Zech 14:16-21) and to all believers, both Jew and Gentile, from all nations being gathered together to worship G-d and Yeshua (Rev 7:9-12). This holiday season is a great time for Christians to share the Gospel, demonstrating how the Jewish festivals find their ultimate fulfillment in Yeshua. See our Introduction to the Jewish Holy Days for more information. Many Jews may be more open to evangelism as they celebrate their heritage as G-d's chosen people, particularly when one realizes that believing in Yeshua doesn't mean that a person stops being Jewish. On the contrary, a person's Jewishness will become complete by accepting the Jewish Messiah. It is also important at this time, and throughout the year, for Christians to pray for the peace of Jerusalem (Ps 122:6). Spc. Patricia Fowler says the Taliban got a lucky shot off, but she was glad to take the bullet. 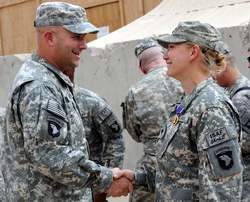 Fowler, a crew chief and door gunner on a Black Hawk medevac helicopter in southern Afghanistan, earned the Purple Heart following that incident in May in which she was fractions of an inch from a much more serious injury, probably death. “I was just doing my job, and they happened to get a lucky shot off,” she said in a phone interview from Afghanistan. Fowler is part of Task Force Shadow and B Company, 5th Battalion, 101st Aviation Regiment, 101st Combat Aviation Brigade, 101st Airborne Division. In May, she was on a helicopter that was in the role of “medical chase,” providing air support to another helicopter sent to pick up wounded Marines. “I feel worse for those guys than I do for us,” she said of her fellow aviators, who set down in the midst of Taliban gunfire to rescue the wounded Americans. Fowler’s helicopter was circling the rescue site at about 300 feet when gunfire started pinging off the helicopter. They began to climb, and Fowler described a sensation of being hit in the back of the head and scratches on her neck. What she would later learn is now a remarkable story of luck and bravery. A bullet from the gun of an enemy fighter had bounced off the helicopter, into her helmet and back out, effectively navigating around her head thanks to a bracket in the helmet. “I had no idea at that time I had been shot,” she said. Her fellow crew members could easily see what was a gaping hole in her helmet caused by the ricocheting bullet. She took off her helmet and saw the hole, and “a good chunk of Styrofoam” missing. Fowler had no idea what had happened, having never lost communication from the radio device mounted in the helmet. Fowler’s helicopter made it to a base where she could be seen by doctors. She had severe pain in her shoulder, which turned out to be shrapnel embedded in her arm from the pinging bullets. “I thought, ‘Cool,’ ” she joked. She admits she had a small breakdown, realizing the narrow miss she faced. “If I’d have been sitting a half an inch further back, it’d have gone through my neck,” she said. And even though Fowler admits she missed certain injury or death by mere fractions of an inch, she said, “it justifies to me that I was doing my job.” “We took fire away from them,” she said of her fellow aviators and Marines, who were in the heat of battle below. Fowler and her commanding officer, Capt. Nick Horn, laughed while discussing the event and camaraderie in the unit, a sign that morale is high. “Sometimes I guess these guys are really amazing, but I have my few friends that keep me grounded,” she said. So, the national media continues to ignore the everyday bravery of our fine men and women soldiers unless they happen to give a poor terrorist a fat lip while resisting arrest, then they're guaranteed top billing on most networks and newspapers for several days running. Yet, despite a lack of support from a certain part of the populous, our heroic troops continue to routinely do their job to preserve our freedoms. To that, we say a heartfelt "Thank You and God Bless".